So Day 1 was a little rough because I didn’t prepare on the weekend but I still made it under the mark. As shown in my previous post I prepared for Day 2 by spending $233.80 of my budget on the 1st day and this was the result. 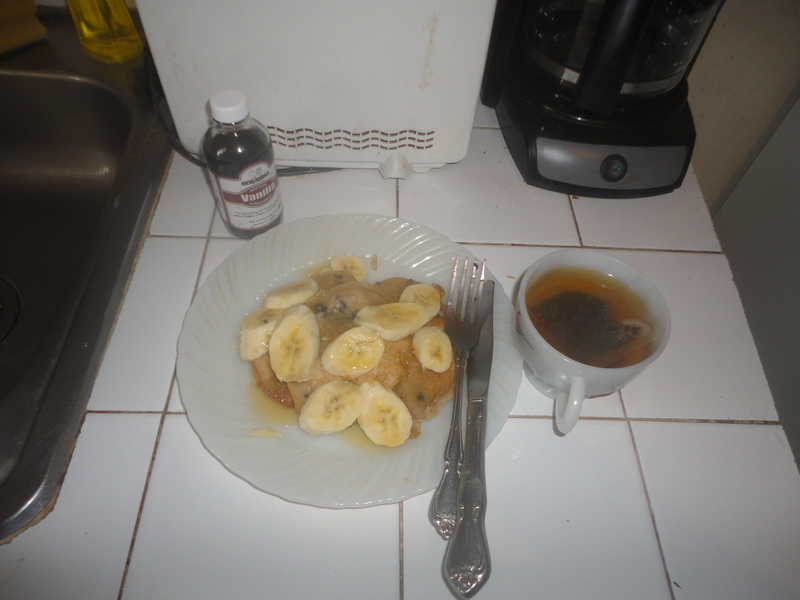 Blueberry Wheat Pancakes with vanilla, my secret ingredient (well not anymore) and a banana and honey which I had in my cupboard. I prefer honey to pancake syrup but even without honey it was still delicious and a cup of peppermint tea was good enough to hold me until lunch. What’s great is I still have pancake mix and bananas to make breakfast for one or 2 more mornings. My only spending at the end of days 2 & 3 was for transportation for $200 each day . Leaving me with all of $300 on both days. What I will tell you is I definitely learned something about myself in these last 3 days. On my way home was feeling happy that I had more than half of my daily allowance to spare and found myself thinking what items I “needed” at home that I could buy with the change. I started thinking I need black pepper , maybe a different fruit besides banana and the few oranges that I have at home. Then when I willed myself to something went off in my brain that maybe I could find a comb in the grocery store to replace one I broke on the weekend. It felt as if I “needed” to reward myself for not spending by purchasing an item that I could justify as a “need” and I could still be proud of myself because I was still within my budget. At the end of the day I did not give in and reminded myself that majority of the things in life we think we need or can’t live without are actually wants and not necessity. 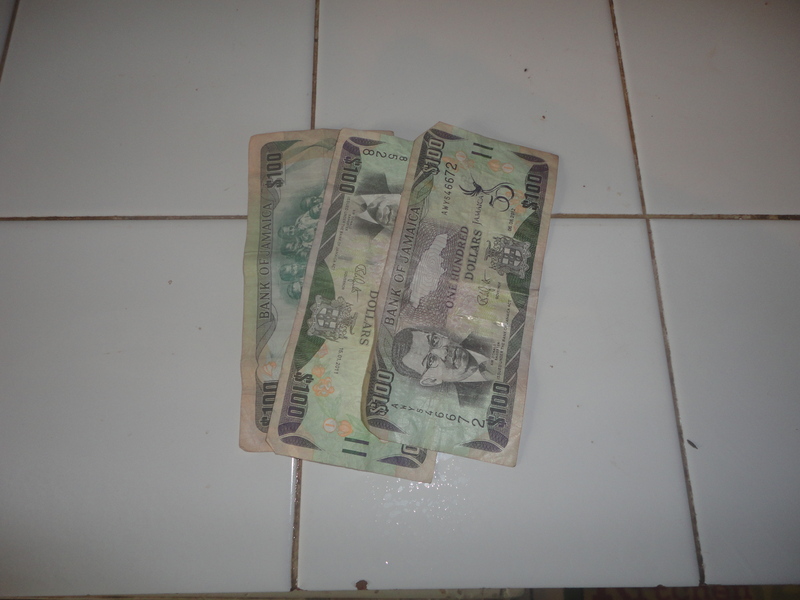 While writing this post I also came to realize that spending change is a habit that is instilled in almost every Jamaican since childhood. I know many Jamaicans especially those growing up in the country will recall being sent to the shop by their parents. As an incentive you were often told that you could take the change to buy something for yourself. This would make any child happy to run errands without complaining as the change was usually enough to buy some form of sweet treat like biscuits , lollipop or gum. I may be taking this thing too deep but I think I may be on to something. The rest of the week I think I will pretty much be able to maintain a $200 spend give and take a pack of gum which I may or may not buy . My next update will be in week 2 so stay tuned or better yet , assess your personal situation , make your own challenge and join us. You may surprise yourself . AWESOME!! I love how this is going Janeen! I have two updates in draft tht I haven’t completed due to being busy as hell but I’ll have them up today for sure. I’ve been learning a few things as well! Can’t wait to share. And yes, you’re right about habit forming from childhood. And that’s the reason for the initial skepticism at this challenge… people, without thinking assume it’s not possible to reduce their spending by this much because they’ve formed a habit to “need” things that aren’t essential. Previous Previous post: “Every Mickle Mek A Muckle” – My November Challenge.